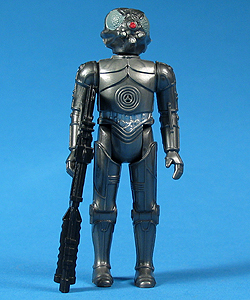 This figure first appeared on The Empire Strikes Back 47 back card. Comments: Most vintage collectors will argue to no end that Kenner's vintage Star Wars line was flawless, but even the most die-hard out there will agree that the toymaker did mess up once. The mistake in question deals partially with the Zuckuss action figure. It seems that the hard working people at Kenner had somehow mixed his and 4-LOM's names up. As a result, to vintage collectors, the dude above will always be Zuckuss. Major Variations: Though all vintage figures have minor variations, the Zuckuss has no major variations.